So believe it or not, the winter fish for some reason react to cold fronts or I should say, are affected by cold fronts much harder than the summer in my opinion. The pressure changes seem to just play havoc on all species of fish. Some more than others, but the walleyes and the perch seem to always be on the forefront of this. I have received lots of texts, Facebook messages, emails and phone calls this week wondering if they should be doing something different or where they should be etc. I guess for me, when your using top notch electronics like my Lowrances and also vexilars, you can get a pretty good indication on a fishes mood fairly fast! I have only been out once this week, I know down week for me, but I was up by Lake of the Woods for my Grandmas funeral. Before everyone sends me condolences, she was 97! That’s a hell of run! Anyway, I was only able to go out once this week. Next week will be better I have a couple spear trips booked and also an angling group booked, so I’ll be reporting lots to everyone next week. So stay tuned! In my findings and by the sounds of it, a lot of folks have seen similar results this week with the drop in temperature. Of course for me, I kept it simple running down to Lake Oahe to an area that has treated me well the past month. I was able to get a limit, but I saw a tons of fish on the screen that were less than excited to corporate. The old school deadstick did most of the damage, but I was able to entice a couple to take a crack at my jigging raps! The normal right on the channels edge, in 30 foot was the best for me down on Oahe. My Percheyes Guide Service crew had a really solid week considering the conditions. They are telling me the perch handled the cold snap pretty good. They had clients out all week doing really well. 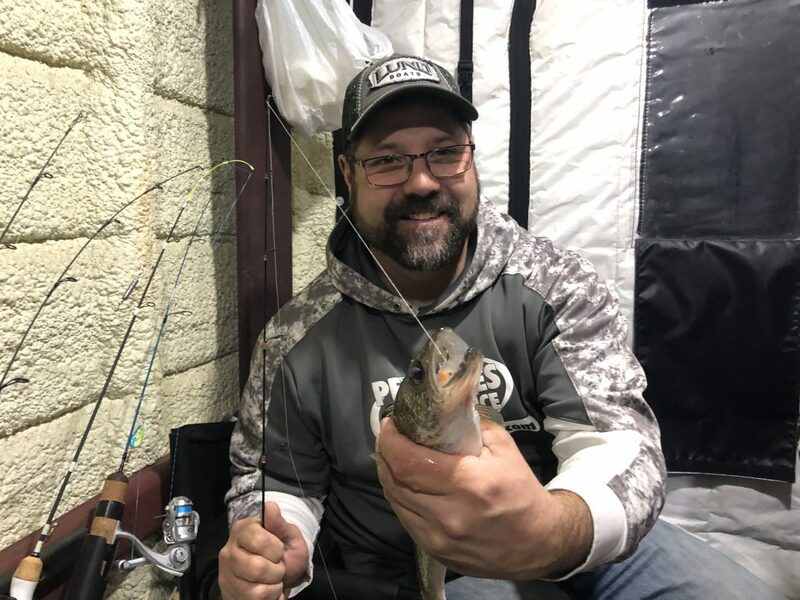 The evening bite for walleyes has been ok for them also. Others I have talked to you say the White Earth Bay Area on Lake Sakakawea is still doing well. Very much the same as down on Oahe. Right off the channels edge has been best between the 25 and 35 foot of water. The Prairie Potholes Report is kind of the same. Nothing super red hot but if you grind out your lake you will eventually fill a bucket. Too many of these waters to name, but some of the usual suspects are kicking out nice size perch!